Versatile water conditioner that is quickly and safely effective against almost all pathogens occurring in ponds. 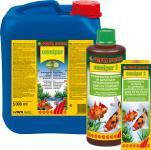 Water conditioner against bacteria and parasites in ponds. Sera Argulol is the optimal product for infestation of fish with carp lice (Argulus), anchorworms (Lernea), gill crayfish (Ergasilus) and parasitic lambs. sera pond ectopur reduces the stress of the fish and supports the disease treatment in ponds by an oxygen releasing salt blend.